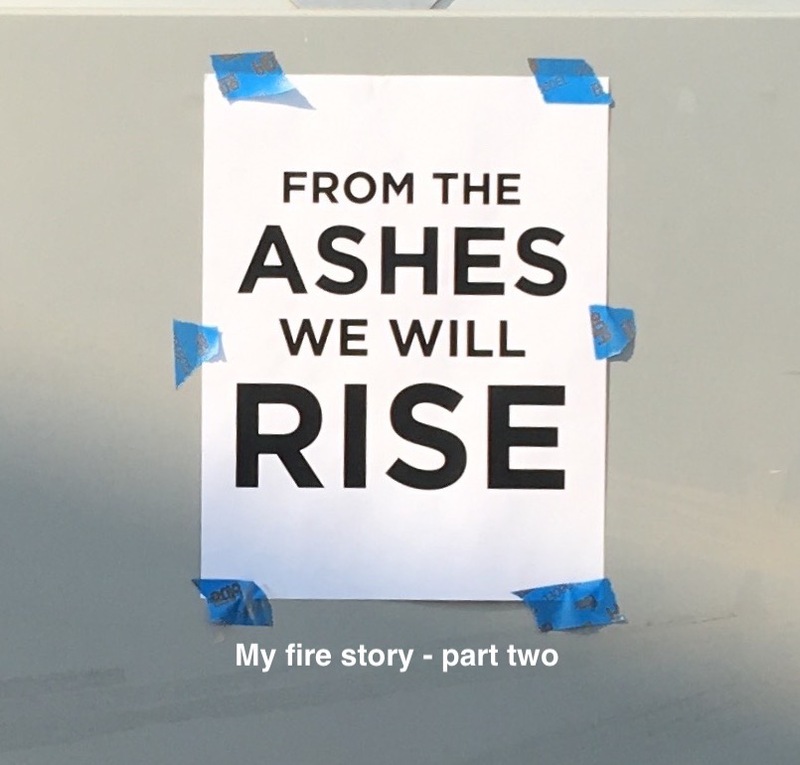 This is what it was like being refugees from the Northern California wildfires. My husband Miles and I arrived in Sausalito as guests of a friend of his, someone whom he had only known online. They had never met in person, but after many years of exchanging ideas in various political forums they felt very comfortable with each other. She told us there was a vacant artist studio we could stay in, which I had somehow pictured as a bare room in a commercial space in town. But as I drove behind him, up a steep windy road that led sharply up a hill I saw that it was, in fact, an apartment attached to her house. We were very grateful to have a place where we could unpack and regroup, which began with pulling the dog beds out of the car and setting up a place for them in the living room. Our biggest concern was that our three dogs behave themselves and not mess up our host’s house. 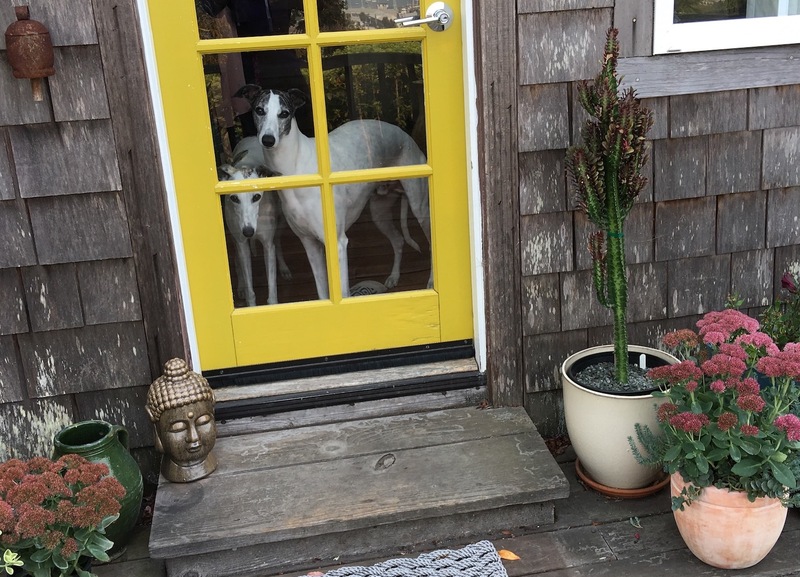 We have a greyhound and two whippets who are used to being able to go through a dog door into our backyard whenever they want. They are not accustomed to having to wait to be walked in order to take care of their needs. This was going to be very different for them. But I was so grateful. Had we evacuated to one of the shelters, we most likely would have had to keep them on a leash 24 hours a day, which would have been very hard on them and on us. Before unpacking anything else we walked the dogs down the long driv eway. They kept sniffing around, looking for a patch of dirt or grass to squat on, but there were no places like that. We then turned down the road, but every surface was either paved, planted or built upon. Eventually they crouched on the pavement and we pulled out the bags to scoop it up. 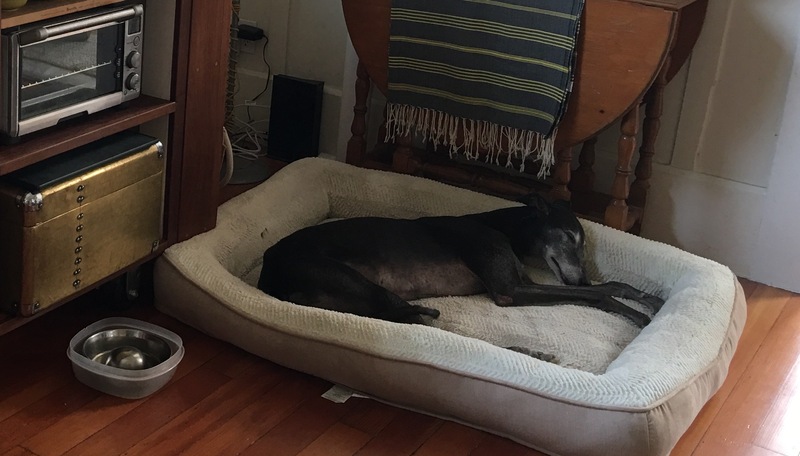 As we returned to the studio, Maggie, our greyhound who is twelve years old, stumbled while walking up the steps to the door and almost fell over the edge. She is at that stage in her life where she is having difficulty maneuvering her body and I realized I needed to walk her separately from the whippets to make sure she didn’t trip and hurt herself. Our cars were crammed full of bags, so I just brought in a small overnight bag that had a change of clothes and toiletries, as well as our bag of food. We were very fortunate. This place had a bedroom and a small kitchen. The dogs looked at me anxiously and I thought I better give them rawhide bones to chew on so I went back to the car, looking for them. I knew I packed them, but I couldn’t find them at first as I dug through several canvas grocery bags. No, they weren’t in the bag with the cans of dog food. Nor were they with the kibble. I definitely remembered packing them. Eventually I found them nestled with my dark chocolate Dove promises. I guess that was during the second round of survival packing, when I grabbed treats. As we tuned into the news websites on our phones we realized how lucky we were. Many people had been forced to flee in the middle of the night, wearing only their pajamas. In some cases their pets panicked and took off, forcing them to leave without them. And there were some people who didn’t even wake up and didn’t make it out at all. Elderly people who used hearing aids didn’t hear the bullhorns at 3:00 a.m. telling them they needed to evacuate. Some couldn’t move fast enough. Trees had been knocked over by the wind, blocking the roads. All of this had happened so fast it was more than our first responders could initially manage. By now it was three days later and reinforcements were coming from all over California but initially it took everyone by surprise. The wind was fierce, blowing down power lines, which sparked and the sparks got carried further, and within a very short time, miles of land, including large residential areas caught fire. I checked the website that was tracking the progress and saw that containment of the Tubbs Fire, the one closest to us, had only gone from 1% to 4%. There were national headlines that wine country was on fire. This was the big news. We were beginning to piece the story together. It was bad, much worse than we thought. And it was far from over. The wind was the wild card that could either give us a break, and enable firefighters to contain the fire, or spread it more widely. Our home was still in danger. Nothing was under control and the wind could blow the flames right down our street. As it was, a neighborhood just a mile away from ours had burned to the ground. One block from us was the border of a mandatory evacuation zone, which meant we could be receiving our orders at any moment. Again, I thought about my belongings, about our home that meant so much to me. Was letting go of everything some spiritual lesson I was supposed to learn? “I forgot to pack my massage certificate, “ I told Miles, fretting. “That’s the least of your problems,” he said. We ate energy bars for dinner and walked the dogs again. Grace, our female whippet, sniffed and sniffed the ground but refused to pee. She’s going to want to go ten minutes after we get back to the studio, I thought. Sure enough, at midnight, after we’d gone to bed she was crying, needing to go. This became a pattern. We walked the dogs about four times every day, but no matter what we did, they woke us up in the middle of the night needing to go again. Just like us, their routine was completely disrupted and they didn’t know how to act. The next day, after Miles and I ate a breakfast of crackers and peanut butter, Jennifer, our host, asked if there was anything she could pick up for us at the store. “Can I come with you?” I asked. The long driveway was very narrow, so our cars were blocked in and it wasn’t easy to get in and out, so I jumped on the opportunity to go to a grocery store. We drove to the Good Earth market and I started thinking up possible dinner menus I could make for Jennifer and the other people living at the house as a way of saying thank you. Walking through the grocery store was somewhat similar to the way I ran through my house, grabbing items at random to put in the car. I didn’t know how long we’d be staying in Sausalito so I started reaching for all sorts of things to put in my basket, trying to think in terms of meals. I’d be halfway across the store searching for tofu and come scurrying back to the produce aisle because I remembered I wanted to put sliced oranges in the dish. I went to another aisle to pick up a bottle of wine and then thought I should go back and get some fresh ginger to spice up the stir-fry. Once again, I was halfway across the store when I suddenly thought I should get walnuts to toast and put in the salad. I wanted to make tasty food, to show my gratitude. But my mind was anything but organized. I was getting lot of exercise running all over the store, worried that I was forgetting something I would want once I started cooking. Once I finally got through the checkout, Jennifer was patiently waiting for me outside. When we got back to the house it was time to walk the dogs again. Miles took the whippets and I took Maggie. We walked up and down the driveway, three or four times until the dogs finally squatted, both of us keeping track of who had done what, so we had a sense of who might still need to go out later. I got busy in Jennifer’s kitchen, opening drawers and finding my way around. I made a marinade for the tofu, started toasting walnuts for the salad. Cooking kept me busy and I really needed to be busy. I was so frantic I hardly knew what to do with myself, so this was good. Cooking helped me feel slightly normal. I have a Bluetooth speaker I always travel with, that syncs with the music on my phone and enables me to fill a room with music. I managed to find it among my things and soon we were listening to jazz. I think this helped calm everybody down. We opened the wine. I got the food prepared and we all sat around the table, eating and sharing stories. I learned about modnomadstudio, this place that Jennifer created to invite artists to do retreats, and met a woman who was currently an artist-in-residence who was living there and going to school. Jennifer had all sorts of creative ideas about ways to bring people together to change the world, to be activists, and to use their art to make statements. She had spent many years as an editor, working for the publishing company Chelsea Green, among others, and was now doing less of that and had time for other pursuits. I was impressed by the way she not only had great ideas, but also knew how to make them happen. As dinner began to wind down Miles said he wanted to check on the dogs. We didn’t want to leave them alone for too long. It wasn’t just that they might need to go out, but also that they were out of their element and we didn’t want them to act out from nervousness and cause a mess or break something. The following morning as I got ready to take a shower, I realized my overnight bag didn’t have any more fresh clothes, so I needed to get some more from the car. Besides, I needed my nutritional supplements. I didn’t understand why I hadn’t put them in the same pocket with my sleep herbs and wasn’t sure where to find them. I also didn’t know which bag had my t-shirts. They must be in my large suitcase, I thought. I pulled the heavy bag out of the back of the car and muscled it up the steps into the studio. When I opened it, all I found were sweaters and heavy clothes. Where had I put my t-shirts, I wondered? And where was my underwear? I felt really lost. The car was so filled with layers of canvas bags and I had no idea where anything was. I stood in the driveway, pulling them out, rummaging frantically for a pair of underpants and a clean t-shirt. Why was there no order to the way things were packed? What was wrong with me? We were able to keep up with friends and hear about new developments through Facebook. Friends from around the country continued to contact us to see if we were okay, and expressed concern about our situation. But while thousands of people were in shelters, facing the enormous loss that we dreaded, we were momentarily safe and comfortable. The anguish of witnessing the devastation to our community was all around us, not knowing if we would be next. As Miles wrote in one of his Facebook posts, our best-case scenario would be survivor guilt. Indeed, we could already feel that. As delightful as Jennifer’s house was in beautiful Sausalito, we wanted to get back home. The dogs woke us up in the wee hours every night and either Miles or I got up to walk them. I figured no one was going to see me at 4:00 a.m. in my pajamas, so who cares, as I walked up and down the driveway with Grace until she felt comfortable enough to relieve herself. But this lack of sleep was getting to us. We felt anxious being away from our house. Miles, who works from home, needed to keep working, problem solving for his organization and logging in for video conferences, doing his best to keep up, but it was hard. One of my neighbors was on vacation in Boston when the fires occurred and she called to ask me to pick up her mail, as she was expecting something important. I knew I needed to get back. As uncertain as everything was, we needed to return to as much of our routine as we could. On the evening of our third day away, George called and told us the electricity had come back on, so we decided we would go home the next day. I made roasted ratatouille for dinner that night, with pasta and sautéed cannellini beans and we enjoyed one more meal with Jennifer’s household. The following morning we packed our car, got the dogs positioned where they would be most comfortable, and said goodbye to our magnificent hosts. How strange, we said, that it took a catastrophe for us all to finally meet. Then we headed back up north to Santa Rosa, unsure what we would find. This is the hardest self-care step for me because it means that I have to stop my usual frenzy of activity and really slow down. I talk a good game but in reality I am always in motion. Between all the things I have to do and the things I want to do it’s really quite a challenge for me to stop and just be still. But, oh my goodness, it is so necessary. We are like bees buzzing around an endless array of flowers, getting caught up in the colors and aromas and we can get lost there, always buzzing, never resting. And yet, magical things come from rest. To do nothing is a powerful act. To be, to rest, to let go. Letting the swirl of energy that is constantly driving us come to a halt. Taking some time to stop and evaluate what we’re doing gives us a chance to prioritize what’s really important. It also gives us time to recharge our batteries and it strengthens our immune systems. One of my New Year’s resolutions this year was to take one day a week just for rest. No goals. No chores. Not even scheduling a fun activity with a friend. A day for true rest. Reading, gardening, taking a nice long walk, even curling up on the couch and watching a movie. For me, rest requires not engaging, which is why I don’t make plans with anyone on my rest day. 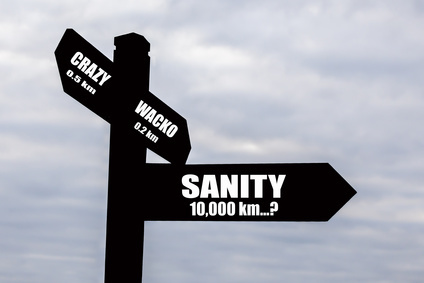 But your mileage may vary. The important thing is to give yourself a true break, where you aren’t “on” and nothing at all is needed from you. It’s quite a luxury. A day of rest gives you a chance to just be yourself. You aren’t playing a role (parent, spouse, friend or whatever you do for a living). You aren’t responding to anyone. It’s a day to truly nurture yourself, to allow yourself to be 100% okay just as you are. Nothing else required. When I was in my 20’s I went on a long trip for several months to Southeast Asia. I happened to arrive in Bali the day before what they call “quiet day.” On that day everything on the island is shut down. No cars or buses run. No restaurants are open. No fires are lit. It’s a day where the entire island hits the “off” switch. All food has been prepared in advance because no cooking is done. A local person explained to me that they do this so malevolent spirits will think everyone has left the island and they will move on. I thought it was wonderful that this whole culture observed a day when absolutely everything and everyone came to a halt and rested. Even the bible talks about having a day of rest each week. 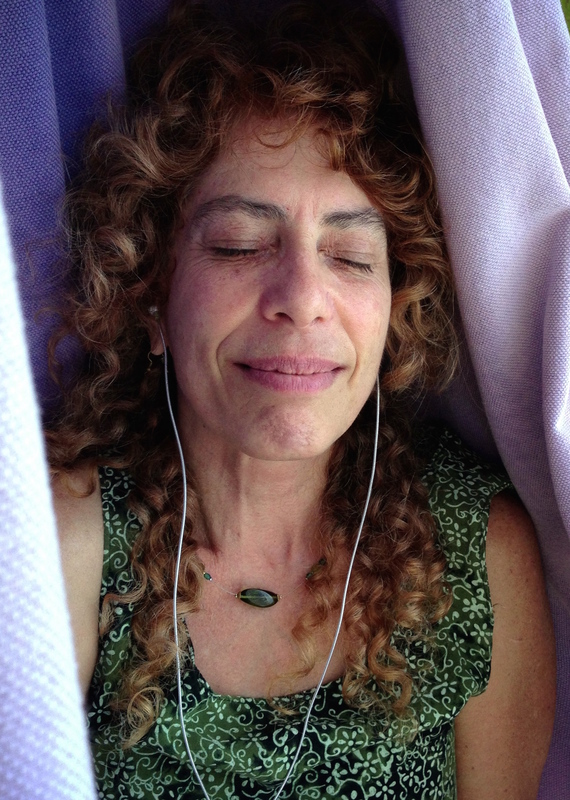 Many spiritual traditions honor a day of rest. Clearly, there is something to this. This is what I’m talking about. We all need some time to unplug. When we can’t screw up because nothing is required of us. I don’t know about you, but to me that sounds delicious.